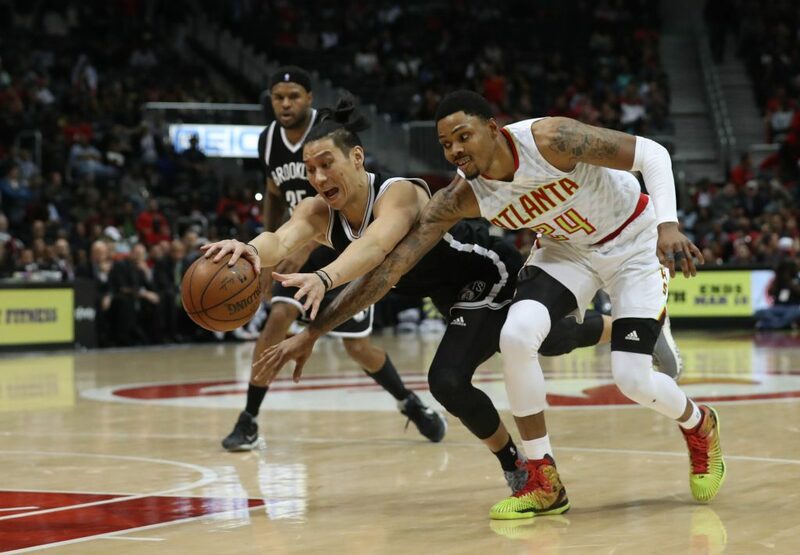 The Brooklyn Nets failed to keep up with the Atlanta Hawks in a close game that ended 110-105 in the Hawks’ favor, with Jeremy Lin having another impressive performance, with his progress and return to form directly affecting (and in a good way) the usually inconsistent Sean Kilpatrick. Jeremy Lin: Lin finished with 16 points and 8 assists, his best passing output since coming from from his injury. He missed a key three in the end and turned the ball over 4 games. But considering what he’s been through this season and who he’s playing with, he’s in a very good spot. He’s averaging 13.1 points in the 7 games since his return, shooting 47% from the field and 51.7% from beyond the arc. His per minute numbers are even more impressive, sitting at 24.3 points and 6.7 assists per 36 minutes. Lin is also picking up fouls at an incredible pace, with 4 in this game (spent 25 minutes on the court). Something to be worried about? Not so much. The overall concept of team defense seems to be something the Nets still don’t understand, and probably will fail to comprehend by the end of this season. Lin’s timing on defense still isn’t as good as it could be, coupled with the overall confusion we see on the Nets side when they’re asked to defend the basket leads to these things, some of which helped Dennis Schroder reach the line 10 times, en route to 31 points. Rest of the Nets: With 27 points, Kilpatrick now has 3 consecutive games of 20 points or more, the first time it has happened to him this season. How hot is he? He’s scoring 23.3 points in the last 3 games, while shooting 54.5% from the field and 66.7% from beyond the arc on 5 attempts per game. Playing next to Lin has a lot to do with it, signaling to Kenny Atkinson; mostly about next season, but also a sign for the now. Brook Lopez scored 18 points in a rough shooting night for him (7-for-18). He did have 5 blocks to go with his 6 rebounds, and once again turned the ball over 5 times. Another performance that makes it difficult for one to make up his mind about whether or not the Nets should hold on to Lopez when thinking about the future. The only other Nets player with double figure scoring was Trevor Booker, scoring 12 points and grabbing 8 rebounds. Up next: The Dallas Mavericks, the Nets final road game on this long trip. The Mavs are coming off 3 straight wins and 5 out of their last 6. The Nets have looked better than they have in a very long time over the last couple of games, and there’s no reason it shouldn’t continue to work against the Mavericks, although on paper, a win is always hard to predict in the Nets favor. I wonder when we’ll see Lin reach 30 minutes. Can’t be too far down the road.